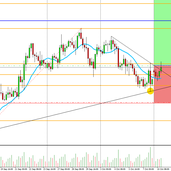 EURUSD short if trendline breaks. Possible short or long opportunity for GBP. We have resistance of 200EMA, trendline and 61.8 fib to break through before we see any long opportunities, right now for me looking bearish back down couple hundred pips. Possible break of trendline could lead for long opportunity. XRPUSD ready to fall again? XRP hitting the 78% fib to precision and pulled back under the 61% fib, if we hold on daily we should see the -27 and -61 levels very soon. EURUSD coming to resistance we could see a pullback and retest of ascending trendline before making higher highs to the extended fib levels which are the green rectangle areas on the chart. if resistance is broken and retested we will see a bullish run most likely to around the rectangle area shown in the chart. Looking at some very strong resistance, this could hold and we will see the continuation of the bearish trend for this pair. we see retracement to the 50% fib before pulling back, we could see this trendline become real, and further upside potential in sight if we stay above. JUST AN IDEA?. Awaiting a minor pullback before we see further bearish action possibly, we have broken through trendline and EMA 200, we may see pullback to the green area which will coincide with the 200 EMA then long term downside to 1.30 area?